Between 2008-9 if p then q magazine ran for four issues. The first two were loose-bound and housed in envelopes with gifts – pens, postcards and CDs. Issue three came out as a set of posters, specially commissioned by The Text Festival, and included posters by P. Inman, Craig Dworkin and Anne Charnock. The final issue was a pastiche of a coffee table magazine featuring Caroline Bergvall on the front cover. Issue three is still in print and available HERE. The first if p then q perfect bound collection, 2008, was Tom Jenks’ A Priori which includes his much-lauded poem 99 Names for Small Dogs. Many other perfect bound collections have met critical acclaim. Holly Pester’s Hoofs and Chrissy Williams’ Epigraphs have both been featured on BBC Radio 3’s The Verb, Peter Jaeger’s A Field Guide to Lost Things was long-listed for The Guardian’s Not the Booker Prize and many other titles have received multiple and positive reviews. Here they are: Lucy Harvest-Clarke’s exhilarating Silveronda, Tim Atkins’ minimal sonnet sequence 1000 Sonnets, David Berridge’s search for the ‘thing’ in Bring the Thing, Derek Henderson’s poignant, systematic erasure of Ted Berrigan’s The Sonnet titled Thus &, Stephen Emmerson’s almost blank page Family Portraits, Geof Huth’s collected one word poems ntst, Tom Jenks’ follow ups to A Priori – the almost sonnet sequence * and the barmy Items, seekers of lice’s text version of Encyclops., Philip Terry’s Advanced Immorality – including his rewrites of Queneau – & Nathan Walker’s tome of web generated one-liners Action Score Generator. In 2014 if p then q reached new heights by publishing the collected works of the great P. Inman, Written 1976-2013. This work not only collects his work in an inexpensive format but allows his work to been seen as something which both changes and, paradoxically, remains consistently constant, as Craig Dworkin points out in his lengthy and fascinating introduction. In amongst all these titles there was still time to publish obscurities, some sold out – Michael Basinski’s Dog Music postcard, Nick-e Melville’s leaflet Junk Mail, as well as the still in print set of trump cards What’s the Best? by Joy as Tiresome Vandalism and Stephen Emmerson’s automatic poetry templates – Poetry Wholes. 2015 saw the first publication of a critical work – derek beaulieu’s captivating essays on concrete and conceptual poetry The Unbearable Contact with Poets, which also offered readers the chance to buy as a print bound copy or obtain as a pdf. This year if p then q has pushed forwards with a new house front cover design and two new titles – Tim Allen’s re-imagining of The Columbia Granger Index to Poetry called Under the Cliff Like and Simon Taylor’s conceptual photo project of imaginary university lecturers Prospectus. Look out for new titles in the near future from Peter Jaeger, Tom Jenks, Emma Cocker and others. If you’ve missed any of these titles you should really check ‘em out. Here are videos drawing together all if p then q’s UK based poets in 2012 and with guest appearances from Michael Basinski and Jennifer Pike Cobbing, a celebration of just over four years of if p then q: at The Betsey Trotwood pub, London. if p then q is a Manchester based experimental poetry publisher with an international focus, which is especially keen on minimal and conceptual poetries. Following on from day’s events at The Free Verse Poetry Fair on 8th September, at which if p then q has a stall, an event will be held in the evening to celebrate the work of the UK based if p then q poets with a special guest appearance by the American poet Michael Basinski who has a limited edition postcard published by the press. A range of videos and sample materials are available on the website. The event is free and very welcome to all. Tim Atkins is the author of To Repel Ghosts (Like Books, 1998), 25 Sonnets (The Figures, 2000), Oriental Tapping (Faber 2006), Horace (O Books, 2007), Folklore (Salt, 2008), and Petrarch (Crater, 2010). A selected Petrarch is forthcoming from Barque, and Honda Ode is forthcoming from Oystercatcher. He is editor of the online poetry journal onedit at http://www.onedit.net. Tim’s if p then q publication is 1000 Sonnets. Michael Basinski is Curator of the poetry Collection, State University at Buffalo. His many books of poetry include Of Venus 93 (Little Scratch Pad) and All My Eggs Are Broken (BlazeVox). 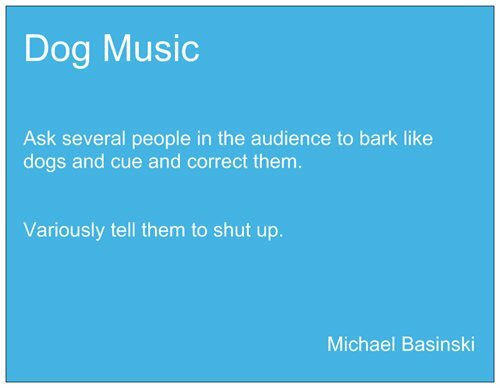 Michael’s if p then q publication is the postcard Dog Music. Lucy Harvest Clarke was born in East Sussex in 1982. After studying Anthropology at Goldsmiths she travelled sporadically and lived by the sea. She now lives and works in London. Her poetry has featured on Great Works, Onedit, in Parameter magazine and in The Other Room Anthology Volume 1. Recently she has published a pamphlet EX3 with The Knives Forks and Spoons Press. Lucy’s if p then q publication is Silveronda. Tom Jenks lives, works and writes in Manchester. He is the editor of zimZalla and one of the organisers of The Other Room. Tom’s if p then q publications are A Priori and *. Holly Pester was born in Colchester in 1982. She now lives in London, teaching and researching at Birkbeck, University of London. Her PhD investigates the history of Sound Poetry and the poetics of analogue technologies. The sound texts and performance scores collected here have featured in various cross-disciplinary events, including the Serpentine Gallery Poetry Marathon, Text Festival 2011 and the Liverpool Biennial. In live scenarios her idiosyncratic vocal technique locates a poetic in between the disciplines of poetry performance, song and new media art. Holly’s if p then q publication is Hoofs. 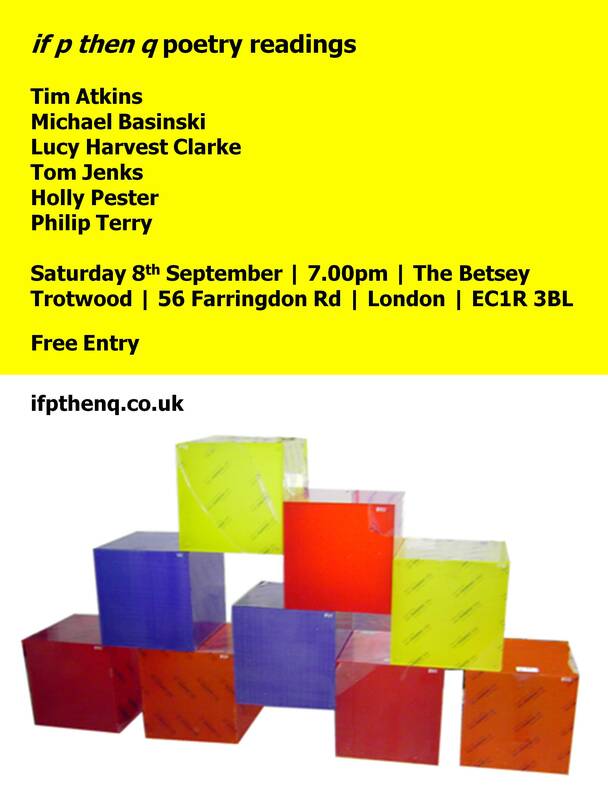 Michael Basinski will read at if p then q’s reading in London on 8th September at The Betsey Trotwood. The postcard shown here can be purchased at the event or earlier at The Free Verse Poetry Fair, see posts below. Or online. Advanced notice of a very special event in London which will include all UK based if p then q poets as well as a guest appearance from Michael Basinski who has a limited edition postcard coming out very soon.